With 2010 around the corner, news outlets are reporting that bookings have increased at ski resorts in BC’s interior. With the crowds and chaos expected during the month of February on the North Shore and in Whistler, it really comes as no surprise. While our interior’s small towns may boast some tasty snow, may I instead suggest something with a view as well? While the deadline for early bird season passes has come and gone, that doesn’t mean you can’t still hit Mount Washington for a fantastic day rate (considerably less expensive than comparable mountains in the interior) once the snow starts falling. Here’s hoping that the dusting that fell last week is just a preview of what’s to come. Crews have been scrambling over the last month to clear brush, bushes and trees to make for expertly sculpted runs on some of the best snow BC has to offer. Also new for the 2009/2010 season is extended night skiing. 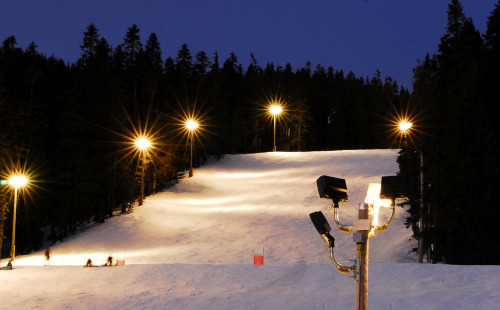 It’s bright lights, big mountain with twilight riding operating from 3:30 p.m. until 10:00 p.m. – that’s a lot of skiing or snowboarding in a 24-hour period. Hungry bellies and beer cravings can still be satisfied at a number of Mount Washington’s dining establishments that are also gearing up. And remember that you don’t need to go far to get a good night’s sleep (only to get up and do it all over again the next day) – tons of gorgeous condos and chalets dot the side of the mountain. 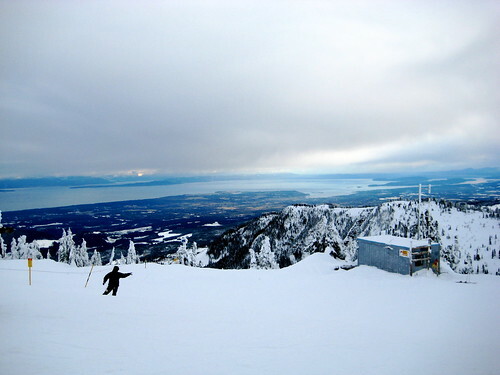 For more information and to plot a winter escape to Vancouver Island, visit Mount Washington’s website. I’m pretty sure that the winter packages will blow your mind. Those pictures are beautiful. I have never had the experience of skiing although its something on my wish list/ to do list. This place British Columbia is it? Well it looks truly amazing. So pretty whoo winter is a coming. @Sabrina – Yes, it’s in British Columbia on Vancouver Island. About 2.5 hours north of Victoria and a little over an hour north of Nanaimo. Great place! yay, can’t wait! We have a cabin up there for the weekend, end of December! We’re so going to try and hit up Mt.Washington this year! All i ever hear are good things about Mt.Washington. Just a bit of a pain to get their with BCFerries being in the way! @Jenny @Keira they have condos for rent there don’t they? And wine. I hear they have wine. Beautiful photos, especially the second one! We really live in a beautiful place. Your pictures of the mountain tops confirm it. I have been reading your posts and relize you sometimes help out local causes. I blog for the JCC Sports Dinner. Our Live and silent auctions contribute to funding programs and services at a Vancouver Community Centre. Our deadline for donations is only one month away.